In most cases, a body of hot magma is less dense than the rock surrounding it, so it has a tendency to move very slowly up toward the surface. It does so in a few different ways, including filling and widening existing cracks, melting the surrounding rock (called country rock), pushing the rock aside (where it is somewhat plastic), and breaking the rock. Where some of the country rock is broken off, it may fall into the magma, a process called stoping. The resulting fragments, illustrated in Figure 3.19, are known as xenoliths (Greek for “strange rocks”). 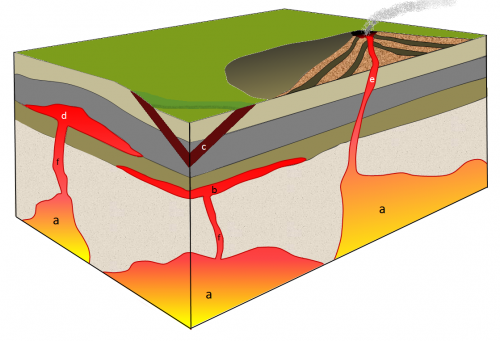 Some upward-moving magma reaches the surface, resulting in volcanic eruptions, but most cools within the crust. The resulting body of rock is known as a pluton. Plutons can have various different shapes and relationships to the surrounding country rock as shown in Figure 3.20. Large irregular-shaped plutons are called either stocks or batholiths. The distinction between the two is made on the basis of the area that is exposed at the surface: if the body has an exposed surface area greater than 100 km2, then it’s a batholith; smaller than 100 km2 and it’s a stock. Batholiths are typically formed only when a number of stocks coalesce beneath the surface to create one large body. 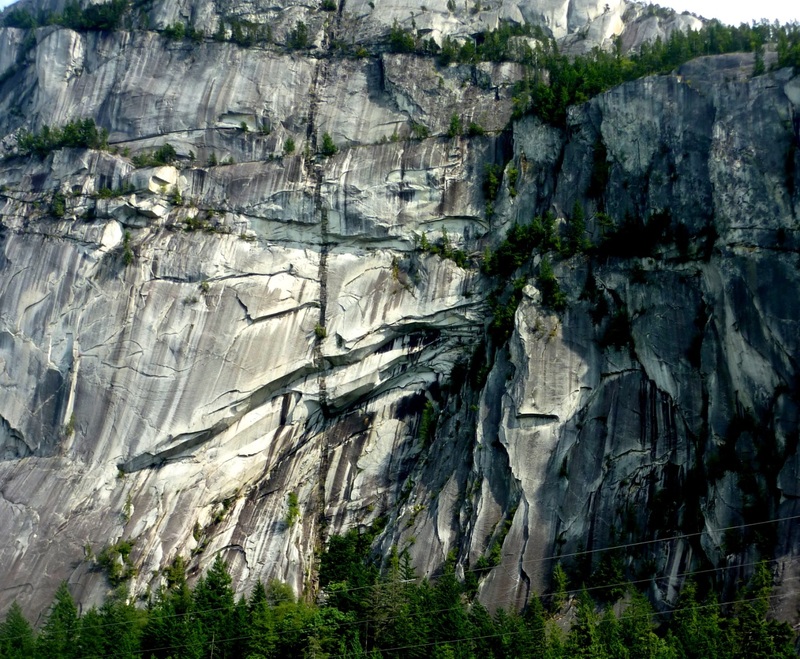 One of the largest batholiths in the world is the Coast Range Plutonic Complex, which extends all the way from the Vancouver region to southeastern Alaska (Figure 3.21). More accurately, it’s many batholiths. Tabular (sheet-like) plutons are distinguished on the basis of whether or not they are concordant with (parallel to) existing layering (e.g., sedimentary bedding or metamorphic foliation) in the country rock. A sill is concordant with existing layering, and a dyke is discordant. If the country rock has no bedding or foliation, then any tabular body within it is a dyke. Note that the sill-versus-dyke designation is not determined simply by the orientation of the feature. A dyke can be horizontal and a sill can be vertical (if the bedding is vertical). A large dyke can be seen in Figure 3.21. A laccolith is a sill-like body that has expanded upward by deforming the overlying rock. Finally, a pipe is a cylindrical body (with a circular, ellipitical, or even irregular cross-section) that served as a conduit for the movement of magma from one location to another. Most known pipes fed volcanoes, although pipes can also connect plutons. It is also possible for a dyke to feed a volcano. 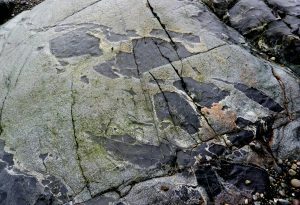 As discussed already, plutons can interact with the rocks into which they are intruded, sometimes leading to partial melting of the country rock or to stoping and formation of xenoliths. And, as we’ll see in Chapter 7, the heat of a body of magma can lead to metamorphism of the country rock. The country rock can also have an effect on the magma within a pluton. The most obvious such effect is the formation of a chilled margin along the edges of the pluton, where it came in contact with country rock that was significantly colder than the magma. 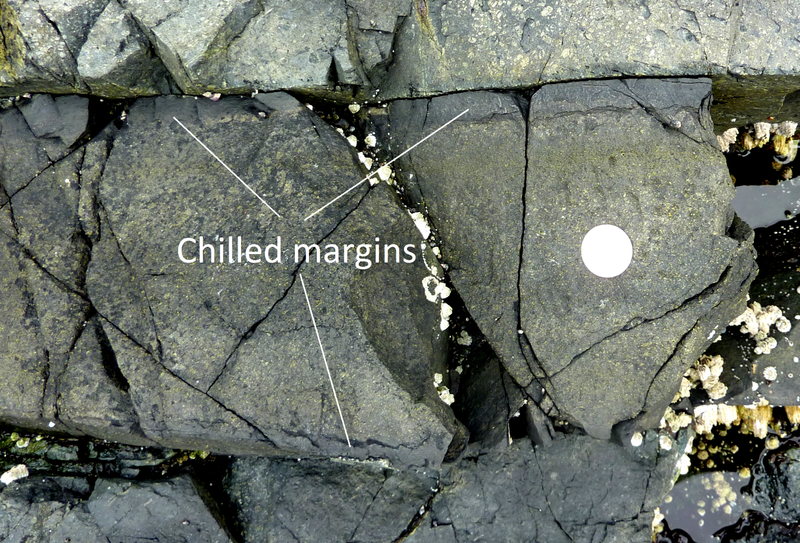 Within the chilled margin, the magma cooled more quickly than in the centre of the dyke, so the texture is finer and the colour may be different. An example is shown in Figure 3.22. Figure 3.22 A mafic dyke with chilled margins within basalt at Nanoose, B.C. The coin is 24 mm in diameter. The dyke is about 25 cm across and the chilled margins are 2 cm wide. The diagram here is a cross-section through part of the crust showing a variety of intrusive igneous rocks. Except for the granite (a), all of these rocks are mafic in composition. Indicate whether each of the plutons labelled a to e on the diagram below is a dyke, a sill, a stock, or a batholith. 3.5 Intrusive Igneous Bodies by Steven Earle is licensed under a Creative Commons Attribution 4.0 International License, except where otherwise noted.